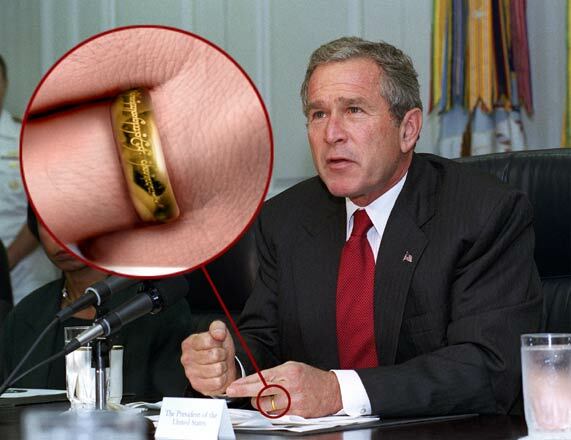 Photo Link of the Day - "Frodo Has Failed"
The UN weapons inspectors report on Iraq's possession of any weapons of mass destruction was inconclusive, but evidence points toward obvious and logical conclusions. The suspicious aluminum casing, suggesting a possible concurrent Iraqi nuclear weapon-development program proved false, it appears that IRAQ HAS NO ATOMIC BOMB DEVELOPMENT PROGRAM at this time. With inspections, under a looking glass, it is unlikely Iraq could develop a nuclear weapon program secretly. And here's the other point of view from the Inspectors' report: Iraq has been non-cooperative in proving that they have destroyed (and do not possess), chemical and biological weapons of mass destruction. If I was in Saddam's head, and possessed weapons of mass destruction that I would commit to using only if under attack, I would disclose this to the weapons inspectors and world before the US invasion. This way Iraq would have the chance to declare that these weapons are defensive, and for PEACE Iraq would commit itself with the UN to Stop All Acts of Terrorism and negotiate for International Disarmament of Weapons of Mass Destruction to Life. Though a war could be imminent in any case, a forthright sincere declaration by Iraq could help influence a new UN Resolution for a new policy of CONTAINMENT, and help lead all nations toward mutual security and disarmament of all weapons of mass destruction to life. Yet the War appears imminent, as tanks are on ships crossing the Atlantic, where leaders in Turkey are getting squeezed by a war machine like no other. But still, the very economy of the US depends on a peaceful resolution. Containment will reduce the threat of terrorism. Attacking increases the risk. Containment is not a final solution – but could give more time for nations to learn how to unite for mutual security, peace and prosperity. The best solution, proposed by leaders such as Dennis Kucinich, is to move towards a world alliance to outlaw all weapons of mass destruction. I have little faith in the current leadership of the US, but a little more if Iraq and the UN work together toward a peaceful resolution that could help stop threats of imperialism, world disorder, terror, and harm to innocent life. Frank Dorrel put together a special 2-hour video called "What I've Learned About U.S. Foreign Policy: The War Against the Third World." The video compilation uses 10 segments to illustrate the drug, money, power, intimidation and influence of a ruthless rogue US military dictatorship, responsible for actions resulting in the murdering of millions of people in the Third World. The National Security Act of 1947 was signed by President Harry Truman.. This gave birth to the CIA (Central Intelligence Agency), and with the atomic escalation of weapons of mass destruction, brought insanity to a corrupted view of what is best for national security interests. The video opens with Dr. Martin Luther King, Jr. speaking out against the US war in Vietnam. Next, John Stockwell, former CIA Station Chief in Angola, 1975, who was then working for the Director of the CIA, George Bush, discloses secrets of his 13-years with the agency. Stockwell provides a short history of the CIA, estimating over 6 million people have died as a direct consequence of the agency's covert operations. This talk was given in the late 1980's. The segment from Bill Moyer's program called, "The Secret Government," which aired on PBS in 1987, is not to be missed. Moyers, a highly respected TV journalist, who also worked for LBJ, interviewed many different people involved with the CIA and other government agencies. This Moyer's special program gives quite an overview of what actually has happened in the last 50 years regarding the CIA. Titles of subsequent segments are "Coverup: Behind the Iran-Contra Affair;" "School of Assassins;" "Genocide by Sanctions;" Amy Goodman talking about two genocides Indonesia committed. First against its own people in 1965, then against the people of East Timor in 1975, both sanctioned by the United States government and aided by the CIA; "The Panama Deception," which won the Academy Award for Best Documentary. This film documents the untold story of the December 1989 US invasion of Panama. The United States military deliberately attacked and destroyed primarily residential neighborhoods, killing an estimated 3 to 4 thousand people in the process. This video exposes the role the U.S. government and mainstream media play in suppressing information about U.S. foreign policy; Ramsey Clark, former Attorney General of the United States, taped while speaking in 1998 in a program called, "Save the Iraqi Children;" S. Brian Willson, a Vietnam veteran, who in 1987 lost both his legs when run over by a munitions train bound for Central America. One reviewer of Frank Dorrel's video compilation wrote: "..the effect of Dorrel's film is greater than the sum of its parts. As a viewer watches through the 10 segments, the similarities in U.S. actions against countries throughout the Third World become almost unbearably apparent.... Dorrel's film is a powerful indictment of the U.S. as an overreaching imperialist power, ready and able to impose its will on virtually any country in the world that seeks control over its own economy or politics." If you're interested in knowing truth, horrible as it is, this video is an excellent resource and education medium. These atrocities, supported by our system, with our tax dollars, will continue until the American people wake up and put a stop to this evil. The first step is to understand that this is really happening. "What I've Learned About US Foreign Policy: The War Against the Third World"
This site includes links to many of some of the groups and individuals mentioned in the video. A link to this site is also posted at flybynews.com under "campaigns, actions, & events. Flyby News will be presenting "What I've Learned About US Foreign Policy: The War Against the Third World" or part of it, at the Jones Library in downtown Amherst, MA, Thursday, March 20, 2003, beginning at 6:00 P.M. A discussion will follow on the topic: "responsibilities for a US democracy and safeguarding our planet." "I feel like the most innocent person in the world," said a... woman, who was literally moved to tears by what she had just seen. "I knew that the government was lying but I didn't know it was this bad, and I want people to talk to me and tell me why people can be so evil for money." The U.S. is not yet at war with Saddam Hussein. Not officially. But quietly, over the past few months, some of its savviest warriors have sneaked into his country. They have been secretly prowling the Kurdish-controlled enclave in northern Iraq, trying to organize a guerrilla force that could guide American soldiers invading from the north, hunting for targets that U.S. warplanes might bomb, setting up networks to hide U.S. pilots who might be shot down and mapping out escape routes to get them out. And they are doing the same in southern Iraq with dissident Shi'ites. But the biggest surprise of all is that they are not even soldiers; they are spies, part of the CIA's rough and ready, supersecret Special Operations Group (SOG). Until fairly recently, the CIA, in an effort to clean up a reputation sullied by botched overseas coups and imperial assassination attempts, had shied away from getting its hands dirty. Until about five years ago, it focused instead on gathering intelligence that could be used by other parts of the government. Before that, traditional CIA officers, often working under cover as U.S. diplomats, got most of their secrets from the embassy cocktail circuit or by bribing foreign officials. Most did not even have weapons training, and they looked down on the few SOG commandos who remained out in the field as knuckle draggers, relics of a bygone era. Now the knuckle draggers are not just back; they are the new hard edge of the CIA, at the forefront of the war on terrorism. And, says a U.S. intelligence official, "they know which end the bullet comes out of." It was George Tenet who began rebuilding the SOG five years ago when he took charge of the CIA, but the attacks of Sept. 11, 2001, accelerated his efforts. Confronted with Osama bin Laden's al-Qaeda, an enemy that has no army, no fixed assets and no clearly defined territory, the Bush Administration needed an unconventional military force. It wanted combatants who could match al-Qaeda for wiliness, adaptability and, up to a point, ruthlessness. It wanted its own army of James Bonds. So in the past year, hundreds of millions of additional dollars have been pumped into the CIA budget by President George W. Bush, a man who may be predisposed to believe strongly in an agency his father once headed. He has ordered SOG operatives to join forces with foreign intelligence services. He has even authorized the CIA to kidnap terrorists in order to break their cells or kill them. All of which could make for a more agile, effective intelligence agency. Or it could also mean a CIA that once again steps beyond the realm of collecting secrets to intervening forcibly in the affairs of foreign states. In that area, the agency's history has often been one of blunders and worse, from Iran and Guatemala in the 1950s through the Bay of Pigs fiasco under John F. Kennedy to the Nicaraguan war that led to the Iran-contra debacle in the '80s. Some longtime intelligence watchers are wondering whether a reinvigorated paramilitary wing of the CIA could be a mixed blessing for America once again. And the military itself is not too pleased. It believes its special-ops forces are perfectly equipped to handle these jobs. Defense Secretary Donald Rumsfeld has reacted in part by planning his own secret unit, which would function much like the SOG but would answer to him rather than Tenet. Though tiny by Pentagon standards, the SOG has swelled to several hundred officers. They are planted in Pakistan, Central Asia, North Africa and East Asia. "These are people who are operating every day around the world," Jim Pavitt, the CIA's deputy director of operations, told TIME. "I can insert a team anywhere quickly and clandestinely." The future may bring even more ambitious missions. Last May, Bush signed a top-secret directive authorizing pre-emptive strikes by the Pentagon and the CIA against nations that are close to acquiring nuclear weapons. Administration sources tell TIME that the Department of Energy's nuclear-weapons experts are training SOG operatives on ways to attack enemy nuclear facilities. In the current crisis with North Korea, Washington so far is committed to diplomacy as a means of pressuring Pyongyang to give up its atomic-arms program, but it might well be a SOG team that gets called to action. The latest debate over the wisdom of expanding CIA powers in this way has been confined mostly to a small group of professionals, escaping the public's notice. That's largely because the evolution of the CIA's mission has proceeded so quietly. Americans did get a glimpse into the world of the CIA paramilitary when American Johnny (Mike) Spann, 32, was killed in Afghanistan in November 2001 after being overpowered by Taliban prisoners he had been interrogating; uncharacteristically, the CIA confirmed that Spann was one of its own, a member of the sog. Another peek into the shadows came last November when it was revealed that the explosion that had carbonized a carful of alleged al-Qaeda operatives in Yemen was caused by a Hellfire missile let loose by a CIA Predator drone. Officially, the war in Afghanistan began on Oct. 7, 2001, with the first round of U.S. air attacks. For the SOG, however, the battle opened on Sept. 26, just 15 days after the attacks on the World Trade Center and the Pentagon. That was how "John," one of the SOG's paramilitary officers, unexpectedly found himself peering out the open window of a Soviet-made Mi-17 helicopter that day as it soared over the Anjuman Pass and into the Panjshir Valley, northeast of Kabul. Just ahead on the ground, John spotted a patrol of bearded men in turbans toting AK-47 rifles. John tugged the sleeve of the pilot from the rebel Northern Alliance, who was aboard to guide the aircraft through the treacherous mountains of northeastern Afghanistan. "They're not ours," the Afghan shouted, letting John know that the helicopter could be fired on from below. The Taliban fighters, however, were so stunned by the appearance of the beastly aircraft roaring above them that they did not have time to shoulder their weapons and shoot before it flew out of range. "Wonderful," the CIA officer shouted to his Afghan comrade. Just a week earlier, John (who talked to TIME on the condition that his real name not be used) had been studying at a language school in Virginia, preparing for an entirely different assignment overseas. (What language and what posting, he would not say.) The agency yanked him out to join the first U.S. team going into Afghanistan. That was typical for a CIA paramilitary officer, who at a moment's notice may be thrown into what John calls a pickup team. John's team included four CIA officers fluent in Farsi or Dari who for years had been sneaking into Afghanistan, recruiting spies for the agency. Their mission now was to hook up with those contacts, collect intelligence for the impending U.S. aerial attack and hunt for bin Laden. Along with the light arms, radios and rations they had packed into the Mi-17 were two suitcases stuffed with $3 million. It was used for bribing Afghan warlords to fight the Taliban and al-Qaeda. Like all the SOG's other paramilitary operatives, John had spent years in the U.S. military before joining the CIA; five years is the minimum requirement. CIA recruiters regularly prowl clubs like those at Fort Bragg, N.C., where the Army's Special Operations Command has its headquarters, looking for Green Berets interested in even more unconventional work and higher pay (a starting SOG officer can earn more than $50,000 a year; a sergeant in the Green Berets begins at about $41,000). Special-forces soldiers, Navy seals and Air Force commandos are routinely dispatched to the agency on a temporary basis to provide special military skills that the CIA needs for specific missions. If a soldier is assigned highly clandestine work, his records are changed to make it appear as if he resigned from the military or was given civilian status; the process is called sheep dipping, after the practice of bathing sheep before they are sheared. Military commandos who join the CIA full time are sent to the "farm," the agency's Camp Peary training center, located on 9,000 heavily wooded acres surrounded by a barbed-wire-topped fence near Williamsburg, Va. There the soldiers go through the year-long course that all new CIA case officers must take to learn such skills of the trade as infiltrating hostile countries, communicating in codes, retrieving messages from dead drops and recruiting foreign agents to spy for the U.S..
the agency's budget comes up. After approving a covert operation, Bush leaves the details of when and how to Tenet and his senior aides. For example, Administration officials say Bush did not specifically order the Predator attack in Yemen. But after Sept. 11 he gave the CIA the green light to use lethal force against al-Qaeda. Rumsfeld, nevertheless, is intent on building his own covert force. He recently ordered the Special Operations Command to draw up secret plans to launch attacks against al-Qaeda around the world, and he intends to put an extra $1 billion in its budget next year for the job. Elsewhere in the Defense Department, small, clandestine units, coordinating little with the CIA, are busy organizing their own future battles. Several hundred Army agents, with what was originally known as the intelligence support activity, train to infiltrate foreign countries to scout targets. With headquarters at Fort Belvoir, Va., the unit is so secretive, it changes its cover name every six months. Delta Force has a platoon of about 100 intelligence operatives trained to sneak into a foreign country and radio back last-minute intelligence before the force's commandos swoop in for an attack. The CIA isn't amused. "Don't replicate what you don't need to replicate," argues a senior U.S. intelligence officer. So who referees this dispute? In addition to running the CIA, Tenet, as director of Central Intelligence, is supposed to oversee all intelligence programs in the U.S. government. But the Pentagon, which controls more than 80% of the estimated $35 billion intelligence budget, doesn't want him meddling in its spying. Ultimately, the man who chooses between them is the President. Both Tenet and Rumsfeld report directly to him. And thus far, Bush has been eager to give Tenet leeway to build up his commando force. With a major conflict looming in Iraq, units from all branches of the military are mobilizing to get a piece of the action. The CIA, at least, will have its own. After a 30-year shutdown of plans for the nuclear rocket, the Bush administration has resuscitated the technology by giving NASA nearly $1 billion in the next five years to expand its space nuclear and propulsion research and development program. "We are still doing exploration of our solar system in covered wagons," says Ed Weiler, NASA's Space Science Chief. "The Nuclear Systems Initiative will open up the railroad." Included in NASA plans are the nuclear rocket to Mars; a new generation of Radioisotope Thermoelectric Generators (RTGs) for interplanetary missions; nuclear-powered robotic Mars rovers to be launched in 2003 and 2009; and the nuclear powered mission called Pluto-Kuiper Belt scheduled for January, 2006. Ultimately NASA envisions mining colonies on the Moon, Mars, and asteroids that would be powered by nuclear reactors. All of the above missions would be launched from the Kennedy Space Center in Florida on rockets with a historic 10% failure rate. By dramatically increasing the numbers of nuclear launches NASA also dramatically increases the chances of accident. During the 1950s and 1960s NASA spent over $10 billion to build the nuclear rocket program which was canceled in the end because of the fear that a launch accident would contaminate major portions of Florida and beyond. This way while driving you can point others to Flyby News' resources. If you wish, $5 for a bumper sticker will cover most costs, (or 3 stickers for $10), but I hope we can get some subsidized for anyone wanting to place them on their car's bumper or other public placement. The artwork and colors are beautiful by Liz Nicholas. If you want one, please write to info@flybynews.com and provide your snail mail address, and specify if you want the blue-green swirling background, or red-orange sunset horizon.